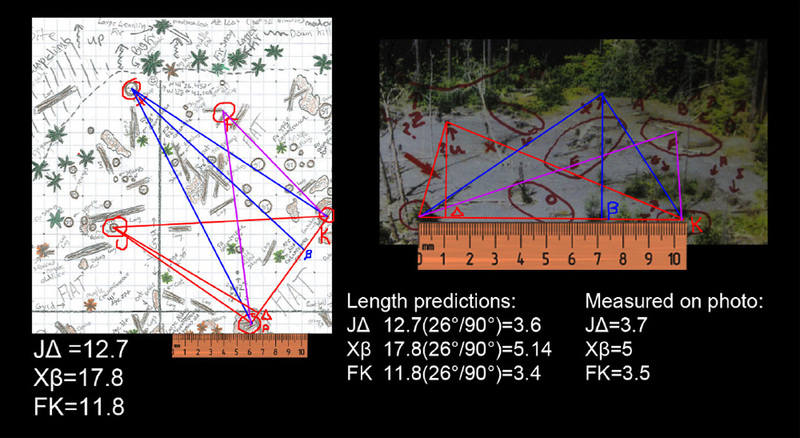 "Overall the geometry of Robert Leiterman, Rowdy Kelley, and Steven Streufert’s survey is a perfect match with the photo taken by Rene Dahinden of the Patterson-Gimlin film site. It's nice to see some actual hard science being applied to the field. The survey was really well done. It made it fairly easy to get accurate numbers. Now all we need is the DNA project to prove these things are real. :-)"
The "Big Tree" hiding in the new "jungle" of Bluff Creek. Photo by Steven Streufert, October 2011. Documentation will continue next summer, but for now this should be pretty much the last major Bluff Creek blog entry here until then. 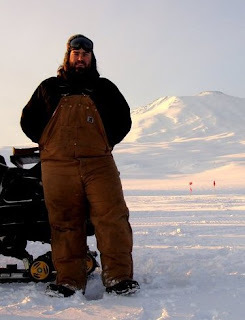 A few more episodes of the video project will appear in the near future, along with an interview being planned with our mathematician, geologist Jamie Snowhorse. I'm hoping to move on to a bunch of other topics that have been brewing in the background (for me) while taking up all of the Bigfooting world's time and attention in hopeless waiting and conclusion jumping--that's right, Bigfoot MindSpeak, DNA, ETs and UFOs, and BS. 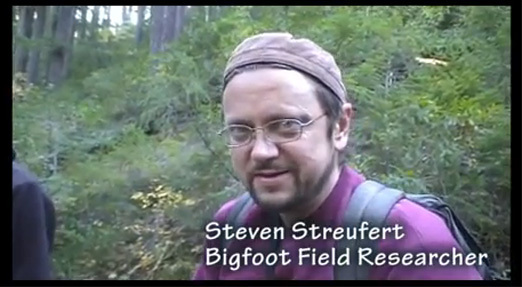 The latter, we hope you know, stands for "BlobSquatches," and many other things in the "Bigfoot Community." 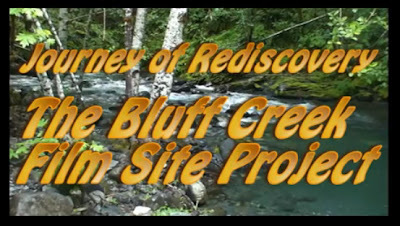 This entry has below the next series of Season Two of the BLUFF CREEK FILM SITE PROJECT VIDEOS, now up over sixty entries. Check them out, Videos 55-62. Click the link above to view them all on YouTube in descending chronological order. Thanks to the BFRO for hosting it on their BFRO-VIDEOS account. Now, on to our main feature. As luck would have it, a fellow wandered into my bookstore one day. He lives in a very woodsy area down in the redwoods, and his wife works there, so he has developed some interest in Bigfoot topics. It just also happened that he was a qualified Geologist, capable of doing mathematical analyses of terrain and locations. I told him about our Bluff Creek PGF project, and he was fascinated. Herein we will use his pseudonym for his last name, for privacy. Comparing the PG Site Survey with the Dahinden "Aerial" Photo. proof for the sake of Bigfooting history. 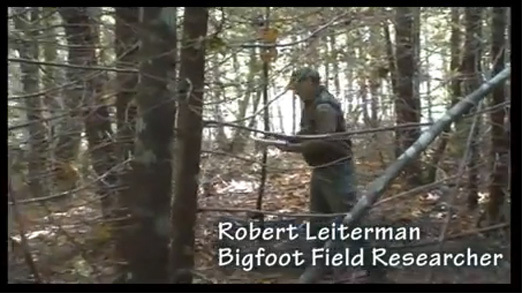 Out of all of the evidence for the existence of Bigfoot none is more compelling than the Patterson-Gimlin film. 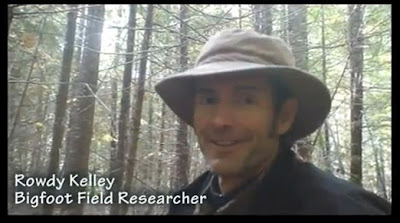 The film is the most studied and analyzed piece of evidence in the Bigfoot community. At face-value it is either a hoaxed video of a man in a suit or an actual creature. Over the years the original location has been highly debated with many different “X”s on the map and none seemed to fit perfectly. Only recently has the newest and most promising suspected location been surveyed and mapped with accuracy. The newly suspected site was surveyed by researchers Robert Leiterman, Steven Streufert, Ian C. and Rowdy Kelley in an attempt to put an end to the controversy. 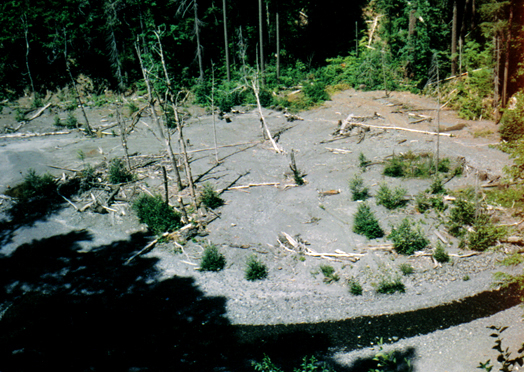 Over the years the site had become overgrown and was subject to hydrologic processes that eroded away at the adjacent streambed. The gravel bar in the film is now meters above the meandering creek. And 40 years of weathering has altered the gravel bar beyond immediate recognition. A photo taken by Rene Dahinden on the hillside opposite the creek shows an aerial view of the original film site. This photo clearly shows the same gravel bar where the PG film was taken. 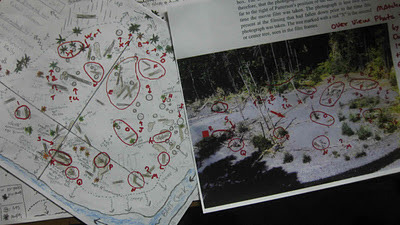 In the photo there are many distinguishing objects that would appear in a survey of the area. These objects are durable and static enough to withstand the test of time and maintain their original positions. The best objects to use as survey monuments are trees and stumps because they are immovable and their positions can be easily surveyed. The photo serves as an accurate record of the film site and It’s monuments. The survey of the suspected site by the researchers is mapped on a two dimensional plane consisting of an X,Y grid with ten foot spacing. The survey is accurate enough to trigonometrically determine distances between objects with an accuracy of a couple feet. It clearly shows the stream bed and sand slope of the evolved creek. 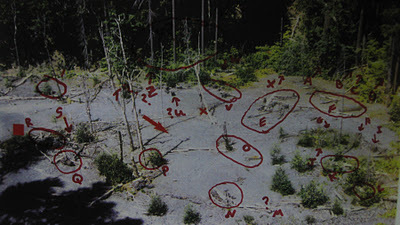 The orientation of the creek and the overall geometry of the survey gives the impression of a direct match; that the survey of the suspected site is an accurate survey of the original Patterson Gimlin film site. Even though the site gives the impression that it is a match with the original survey site, further mathematical comparison is needed. and survey work by Streufert, Leiterman, Rowdy Kelley and Ian C.
Copyright. Research Purposes Only. CLICK TO ENLARGE. The survey site and the Dahinden photo can be compared geometrically to prove that they are a match. And the first step in that process is to determine the angle of the camera of the Dahinden photo. To do this, a line is drawn between two monuments in the photo. For ease of calculation this line should be perpendicular to the camera and be significant in distance. A line between monuments marked P and K is suitable.This is the line all calculations will be based on. A Third monument should then be selected to complete a triangle between them. The same triangle should be drawn on the site survey between the same monuments. 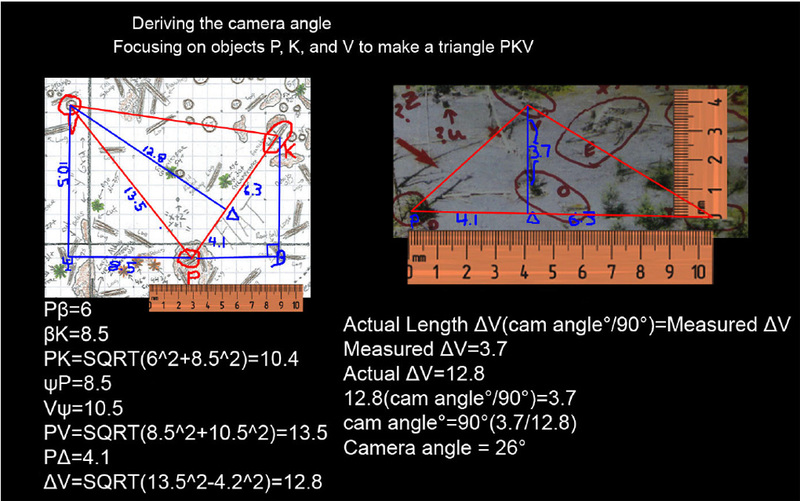 Now that there are two triangles to compare, the actual distances between the monuments in the survey are measured. For an accurate comparison and to double check the trigonometry a calibrated ruler is needed. For the site survey this should be calibrated to the grids set out on the graph. For the photo the ruler should be calibrated so that the actual distance of line PK should be marked on the corresponding line on the photo and the ruler should be stretched to fit (in this case 10.4x10 feet or just 10.4). The 1971 Rene Dahinden "Aerial" Photo of the PGF Site. With this equation, an approximation of the camera angle is derived. Therefore, if the actual length of line ΔV is 12.8 and the measured length is 3.7 then the approximation of the camera angle is about 26 degrees. This camera angle can then be used to find objects seen in the photo and objects documented in the survey. If the monument’s actual position corresponds with the measured position on the photo then the survey location and the photo location are a match. Proof Diagram 1: Camera Angle Comparison. Now that the camera angle has been derived, it is used to predict lengths that would appear in the photo. Proof Diagram 2: Landmark Comparison. 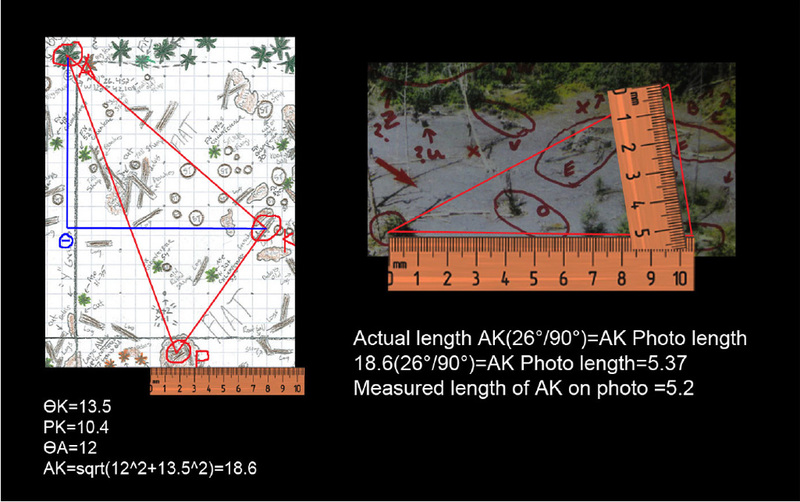 Based on a camera angle of 26 degrees the prediction of the length of line AK in the photo at 5.37. When the photo is measured with a calibrated ruler the measured value is about 5.2 which is very close... within 2 feet. This proves that the geometry in the survey correctly matches the geometry of the photo. Even more objects can be compared this way to determine their corresponding locations. It is easiest to use the same calibrated line PK to base the trigonometry off of. Next, the position of monuments U, X, and F are exacted. Their positions were verified with an accuracy of about two feet. Proof Diagram 3: Further Triangulation. 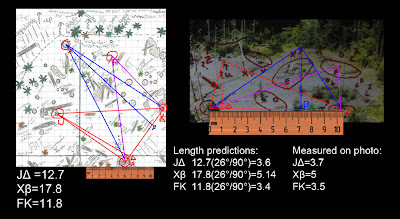 Overall the geometry of the survey is a perfect match with the photo taken by Rene Dahinden of the Patterson-Gimlin film site. From this survey, accurate positions in the film of the alleged creature can be exacted which could prove to be useful to determine further information about the film and it’s subject. "I'm a geology student at HSU. I Work for the US Antarctic program. I live in Orick and maintain a small network of trail cameras around the national park. I'm a geology and science enthusiast. I'm also a skeptic and freethinker. I could come up with more but I'd have to do some serious introspection..."
2011 Site Map. 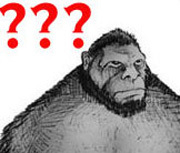 No, the red circles are not "blobsquatches." UNIQUE WORK HEREIN IS COPYRIGHT, FOR RESEARCH PURPOSES ONLY. Animal Planet during the local FINDING BIGFOOT filming. Me, you probably know me all too well. at least it came to something REAL in the end. who forced Ian and me to actually document this stuff. Ian C., in partial retirement, well OK, total Bigfoot retirement, at least for now. Ian was a founding member,along with myself, of this obsessive pursuit. he had had enough of California and gotten lost in the mountains of Virginia. If there is going to be a BIGFOOTERS OF THE YEAR award, it should go to all four of us, not just Robert and me. Thank you to Daniel Perez and BIGFOOT TIMES for the honor. 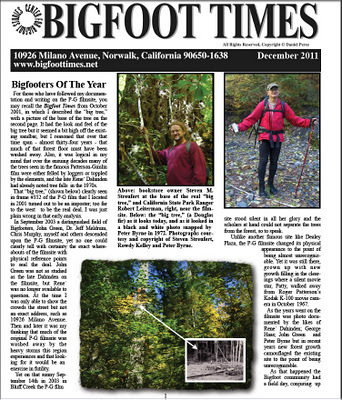 READ A FREE ISSUE OF THE NEWSLETTER Containing the Bigfooters of the Year Award on our Bluff Creek PGF site research HERE. Yep, we're not bragging. We just want to share the information, as always. Click on the player boxes below to view the videos. If that isn't good enough for you, right-click on them to open in another window. The continuing drama of the BLUFF CREEK FILM SITE PROJECT. This is Season Two, brand NEW. Back to the Creek Again! Here you will find the "Discussion at the First Sighting Spot" episode. Part 55. Check it out! The continuing drama of the BLUFF CREEK FILM SITE PROJECT. This is Season Two, brand NEW. Back to the Creek Again! Here you will find the "Where did Bobo Walk? and Start of the Site Survey" episode. Part 56. The continuing drama of the BLUFF CREEK FILM SITE PROJECT. This is Season Two, brand NEW. Back to the Creek Again! 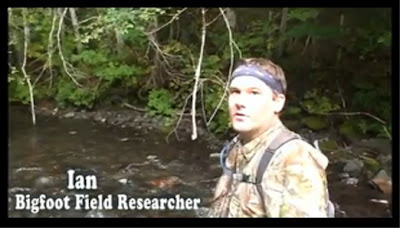 Here you will find the "PGF Site Survey in Action" episode. Part 57. The continuing drama of the BLUFF CREEK FILM SITE PROJECT. This is Season Two, brand NEW. Back to the Creek Again! Here you will find the "Stomping Around in the Bluff Creek Jungle" episode. Part 58. The continuing drama of the BLUFF CREEK FILM SITE PROJECT. This is Season Two, brand NEW. Back to the Creek Again! Here you will find the "Dog Barks at Bigfoot while the Guys Analyze Trees and Cross the Axis" episode. Part 59. This is Season Two, brand NEW. Back to the Creek Again! 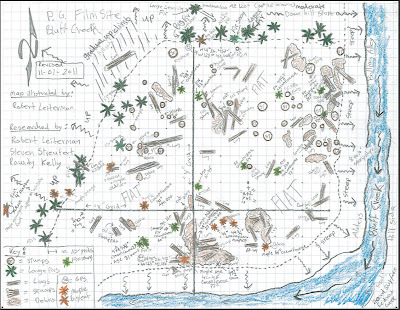 Here you will find the "Pacing the Grid Layout and Marking the Stumps and Debris Piles" episode. Part 61. This is Season Two, brand NEW. Here you will find the "Marking the Grid, Big Trees, and There You Have It, Folks, The Patterson-Gimlin Film Site" episode. Part 62. WATCH FOR THE LAST FEW SEASON TWO VIDEOS COMING YOUR WAY SOON. What can me say? I show hu-man guys to film site many time, they just no see. Now they get award, and what I get? Bunch of survey flags on my home turf. It not funny. When Bigfoot get award? I the reason you all out there on snipe hunt. Me make you famous on hu-man TV, and I not even get cameo role? I start think again go back to eat hu-man and dog, be monster again and not care. No more Mr. Nice Bigfoot, me say. 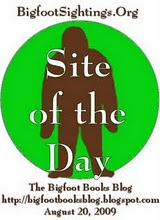 This blog is copyright and all that jazz, save for occasional small elements borrowed for "research" and information or satirical purposes only, 2011-2012, Bigfoot Books and Steven Streufert. Borrowings for non-commercial purposes will be tolerated without the revenge of Angry Bigfoot, if notification, credit, citation and a kindly web-link are given, preferably after contacting us and saying, Hello, like a normal person would before taking a cup of salt. No serious rip-offs of our material for vulgar commercial gain will be tolerated without major BF stomping action coming down on you, hu-man. 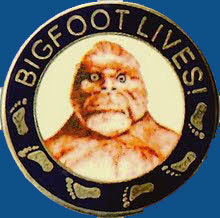 I love Bigfoot, but I don't believe. And, I don't mean to sound harsh, but nothing that I've read on your site has changed my mind. I was pleased to see the use of trig to derive angles and distances. I hope this can be backed up in the future by snapshots (single-frame images) taken by a K-100 on-site to further confirm these estimates. Is there any chance of getting permission to clear the site of shrubbery? A cleared site would help greatly in this confirmation process. If the site could be cleared, then the arguments of debunkers like Schmidt & Daegling, who claim that there isn't enough data in the film to make estimates of the Bigfoot's IMI and other ratios, could be debunked. Photos could be taken at a range of distances and angles-to-the-subject (ideally, a flexible, adjustable model of Patty, or at worst a guy in a gorilla suit) and it could be shown how this set of photos brackets (narrows down) the range of possible values. This repetitive test-fitting and narrowing down could converge on a tight range of possible IMI values, and other body-part ratios, as well as walking speed, that are outside the human range. In conjunction with tests on a model with Patty’s estimated body-part ratios, an ape-suited human, and a human in ordinary clothing, could be photographed at the same spots and in the same postures, to demonstrate how they wouldn’t “fit” the mathematical requirements of the test. This would provide disproof by contradiction of the claim of anthropologist Sarmiento that external estimates of IMIs have enough slack in them to allow a human to appear to have Patty’s limb ratios. These inhuman features are very strong evidence of Patty's reality. (So are Patty's un-costume-like features and movements, such as lip movement, teeth, tongue, etc.) None of the other objections to the PGF could outweigh math's remorseless logic. Even if the film site isn't cleared, this analysis could be done in an unused football field in which proxies for the stumps and other landmarks matched their position in the film. A football field’s own landmarks would be very helpful in accurately placing landmark proxies on it. (E.g., “place stump #3 on the 20-yard line, 23 feet and 2 inches from the sideline.”) A fine-grained gridded map, based on an exquititely accurate measurement of the filmsite’s landmarks, would allow others to replicate this test. I saw a Tv show years ago who interviewed participants of the PG film who admitted the film was staged .. and talked to a man who walked very muchh like the BF in the film. The film indicated the entire town was aware of this and goes along with the myth. Please enlighten me.